Leisure time is clearly our most valuable asset in an era where we are available online at most times of the day. We would expect that in the coming Internet of Things world, our humble refrigerator will self-replenish and perhaps give us some guidance around what and when to eat. That might be a bit down the track, but already, companies like Samsung, LG and Electrolux have released smart fridges that include LCD touch screens and applications. They also include smart routers and WiFi connectivity just in case you want to tweet from your fridge or leave a message. There’s also the GE FirstBuild fridge, which allows for customisation using 3D printers. This fridge comes with an open source app that enables you to check the contents from remote online locations. But there’s one ingredient missing from the budding chef’s kitchen – a fridge that compiles your shopping list and perhaps even orders food for you. Fascinated about how smart fridges of the future will connect with a shopping service, CIO contributor, David Gee, spoke to Manutea Dupont, the co-founder of Australian startup, ShopWings. CIO: What is ShopWings' value proposition and why would I use this service versus shopping myself? Dupont: ShopWings is about convenience and choice. There are two things which are unique in our offering. Firstly, the ability to shop from Aldi or Coles or Harris Farm from the same online platform in a few clicks. Secondly, because of the way we operate we are able to make deliveries in as little as 2 hours with 1 hour delivery windows while most existing services have at best next day delivery and larger or less accurate delivery windows. CIO: What technology drives this service? We have developed proprietary technology that creates a seamless experience both for the customer and the shopper. The shopper in particular has access to a shopper app in which he or she will be able to get all the details about each order, the delivery time and address etc. CIO: How important is mobile payments for the service? Dupont: We are in the process of launching our customer app in the next few weeks. Mobile payment will of course be available on the app. We expect this to be an additional growth lever. CIO: What inspired your startup? Dupont: ShopWings has been inspired by our experience in Ride sharing where we connect riders and drivers together. We realised that with the peer to peer connection between a customer and a shopper, we were able to address the grocery delivery market which is one of the most untapped online markets to date and yet the one that will probably be growing the fastest in the next few years. CIO: In terms of average basket size of your shoppers, what is the experience that we have in Australia versus overseas markets? Is the average basket size of shoppers very consistent week to week? Or does this vary depending on how shoppers use the technology to select items? Dupont: The average basket size grows as we grow our business. As people try the service and use us again, they chose to switch to our delivery model and trust us with their whole weekly shop. Basket sizes in Australia are larger than in other markets as the market is quite educated when it comes to online retail. CIO: ShopWings offer goods from a number of organisations, how did you choose these partners? Dupont: Our objective is to help any retailer go online and offer our unique layer of convenience to their customers. We started with Aldi, Coles and Harris Farm which have very complementary offering as well as a good networks of stores that cover the areas we deliver to in Sydney. CIO: What is your technology stack? What makes your technology special? Dupont: Technology is at the heart of ShopWings. We are a software company providing retailers a logistics solution to get their products to their customers faster than ever before. This speed of delivery is enabled by the ‘sharing economy’ and smart phone penetration that allows us to locate shoppers and provide them with the tools they need to pick the relevant items. Shopper supply forecasting. We have to match – almost every minute – supply and demand. This means handling a lot of uncertainty on a lot of dimensions being the location of the shopper, the customer or the store, the availability of the shopper, the size of the order etc…To do this we have built a bespoke back-end system that forecasts demand depending on the different areas of the city. Smooth end-to-end integration. We offer an end to end solution where customers are connected – through our front and back end, and shopper app – to a shopper available in that area and at that time. The shopper has an app that allows them to pick the right items, organise the shopping list and directs him or her to the customer’s address. CIO: What happens when an item is not available? When an item is not available, then a shopper can call the customer through the app to offer a suitable replacement or ask for the potential cancellation of the item. CIO: What human discretion is there for your shoppers? While technology is crucial to help shoppers, they have to make judgement calls in the shop all the time. These are the choices that one intuitively makes when shopping in a store but it brings it to a whole other level of complexity when one has to make those choices for someone else. These may include finding the best alternative to a product, picking the best and freshest item every time, and making sure expiry dates are valid. CIO: How does a customer deal with items that are damaged or soiled? Is that managed digitally or manually? Dupont: The great thing about ShopWings is the fact that the delivery person is the person who also picked the items for you. That means that you can interact with him at your doorstep regarding any potential issue. 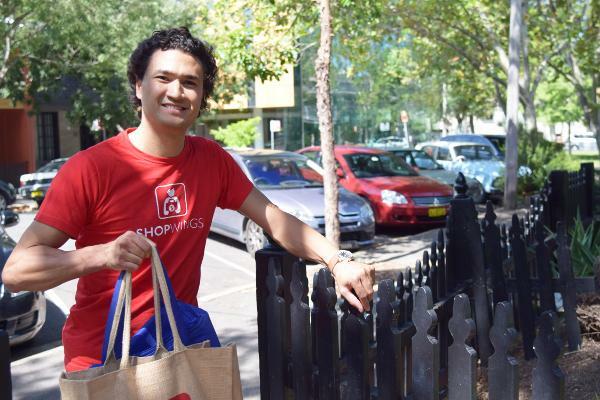 Happy shopping … bring on that smart fridge!